If, like us, you are fascinated by weird and wonderful experiences then spending an evening at the North Korean state-owned restaurant, Pyongyang Koryo in Yangon has to be added to your bizarre bucket list. Situated in a hidden street, the restaurant is one of only a handful of North Korea’s infamous state-run restaurants outside the country. Having been tipped to visit Pyongyang Koryo on our arrival in Yangon, we were excited to experience this unconventional dinner destination. When we arrived at the restaurant we were immediately met by several excitable waitresses dressed in traditional North Korean attire. Wasting no time they set about instructing us on what we weren’t allowed to photograph. This unconventional welcome very much set the tone for what was one of the most bizarre eating experiences of our lives. After our strange briefing we were shown to our table which was in the corner of a large room, occupied by only four other guests, ten or so waitresses, one stern looking manageress and a large stage in front of which we were seated. Taking in this slightly odd environment we began to browse the menu and were quickly struck by just how expensive everything was. Myanmar is an affordable country and its capital, Yangon, is no exception with eating out costing between £3 - £10. Therefore the sight of mains at £15 plus was surprising to say the least! Did this mean the food would be gourmet? Intrigued, we ordered what we were told was a traditional North Korean feast before beginning to try and coax some conversation out of our waitress. Having been fascinated by this famously secretive state for years, we naturally saw this as a good opportunity to learn a bit more about life in North Korea. No such luck though as our waitress was clearly not comfortable answering any enquiries unrelated to the menu and her nervous giggles were a sign that we should cease our enthusiastic questioning. With one final giggle she ran off behind the stage curtain followed by several of her colleagues. Before long she returned carrying our pricey North Korean feast, a mixture of broiled duck, mystery soups and boiled vegetables. I think it is fair to say that the food was average at best with some incredibly pungent flavours dominating the meal. However we were quickly distracted by the shock of very loud music being blasted through the speaker system and the appearance of six waitresses on stage. It was at this point that our evening went from slightly unconventional to completely bizarre. For the next hour and a half the waitresses, who had all changed into new colourful outfits, put on what can only be described as a medley of traditional North Korean music, instrument playing and dancing. I’m not sure what we were expecting but it certainly wasn’t this; our disbelief at the surreal show was only matched by our amazement at how talented our waitresses were. 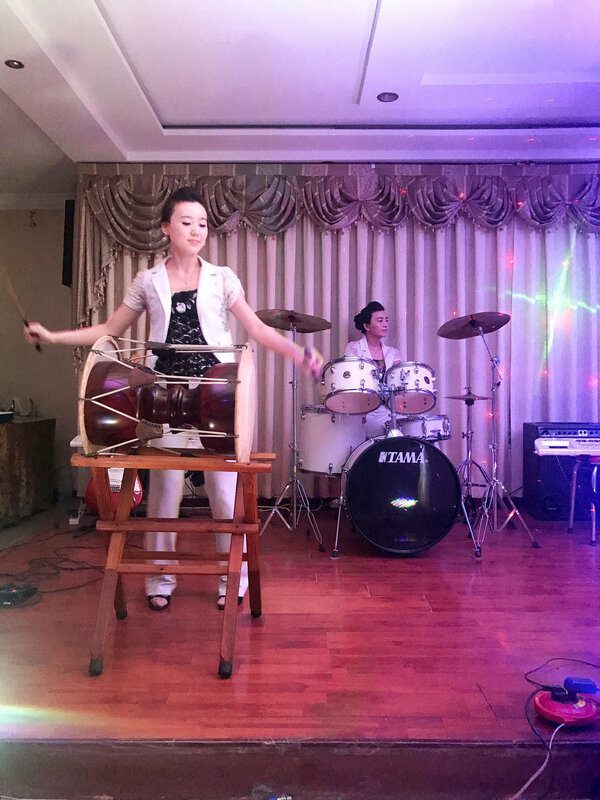 They performed solidly, without breaks, the entire time, dancing in perfectly synchronized routines, singing an amazing variety of North Korean ‘classics’, playing a vast spread of bizarre instruments before forming an all girl rock band for the crescendo. The whole time this was happening, the manageress, still void of any emotion, was walking around the room handing out bouquets of flowers between the two tables of guests. We quickly learnt from the other table that the idea was to ‘shower’ the girls with the flowers as they performed and so we did exactly that, which resulted in a strangely artificial exchange. Once the performance was over we joined the staff in a standing ovation as the girls on staged bowed repeatedly before hurrying off behind the curtain which was our cue to pay up and leave. We had chosen Pyongyang Koryo as we were looking for a completely unique dining experience, one that would be hard to replicate and it certainly did not disappoint! If you are ever in Yangon and are intrigued by the concept of a North Korean dining experience, do not hesitate, this really makes for an extraordinary evening.